In our IndieViews series, we get an in-depth look at the extraordinary people who make Indie Source work. Inspired by Indie Source’s unique mission and culture, Development Project Manager Jenn O’Mahony creates outstanding results for clients’ fashion lines. I’m a Project Manager within the Product Development division. Designers come to us with their ideas, and we help bring those to life through sourcing materials, making patterns, and hand sewing. Development is the beginning stage of creating your own line, and we help clients make their prototype and/or sales samples. I work with new designers and manage their development projects. This includes managing each step of the process: coordinating with them for our introduction meeting and planning, sourcing materials, pattern making, and sample making. I communicate with the clients on a constant basis to make sure we are creating exactly what they want and ensuring to keep us on schedule to have their samples done by their due dates. I also work with them to help meet their target price and get them fully prepared to move into production when they are ready. Additionally, I oversee the internal team that make all of this happen, including our fabric specialist, trim specialist, pattern maker, and sample makers. How did you choose Indie Source? Zack [Hurley] and Jesse [Dombrowiak] have a great vision for where they want the company to go, and I was on board from the moment they explained it to me in my interview. They’re two very down to earth guys but know exactly what they’re doing. Business savvy and genuine, these are the kind of people I like to work with – and I think our clients feel the same. Client meeting with Arthur of FitScrubs. From left: Arthur, Jenn, Jesse. 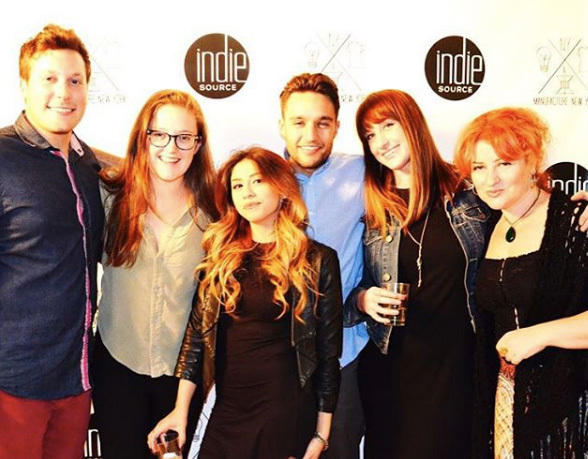 What sets Indie Source apart from other fashion companies you’ve been involved with? What drew me to them at first, and why I’ve stayed – positive vibes. Everyone makes an effort to be happy. We all get stressed out from time to time, but everyone makes sure to keep positive about all of it. It’s very refreshing in this industry! I’ve always been interested in the fashion industry. I majored in Apparel Merchandising at Oklahoma State University and moved to LA after I graduated knowing that I wanted to get into the fashion industry here, but had no idea how. So my first job in LA was working as a Visual Merchandising Manager for a national women’s clothing store. Then I moved to work for a women’s contemporary dress line as their Pre-Production Assistant and later as Marketing and PR Coordinator. I held each of those roles for two years respectively, but I’d say that the Pre-Production Assistant job is what most prepared me for what I do now. It’s been a windy road with time spent in all areas of the industry, but I think that well-rounded experience gives me a unique perspective when working with the designers that come to us! What’s the range of clients and fashion markets you work with? Here at Indie we’ve worked on a little of everything! Clients range from very green young artists who just want to get a line started, to celebrities who want help starting their own brand. Garments we’ve worked on include: lingerie, baby clothes, women’s contemporary, men’s street wear, athletic, aprons, scrubs, and recently a fur collar. We’ve done almost anything you can think of if it has to do with apparel! Do your research. Know what your target market is and find a niche to go for. You don’t want to get lost with everyone else making printed t-shirts. Do something unique! And have a budget. Take the time to plan out how much you want to spend on each piece of the puzzle and see what your total budget will need to be. This is a huge part of getting started in the industry and people will take you much more seriously if you know your target prices and have money saved to make your dream happen. Launch party at The Reef. L to R: Jesse, Emily, Nara, Zack, Jenn, Lana. I’m always learning about something new because our clients are constantly coming up with new ideas and we have to figure out how to make them happen. The building we’re in is great as well because we are surrounded by creative people. It’s very inspiring. My favorite memory so far is when my first development fashion brand went into production. They were so excited to be producing the garments and super happy with the outcome. It was great to see all of our hard work together pay off and see their dream come true!